Jodi McFadden and Company in Chicago, 2015 Season. Photographer: Hilary Gauld-Camilleri. As the lights dim in the theatre, I know that my husband is in for an interesting experience, as he has no background knowledge (other than the quick Cole’s notes version I gave in the car ride to Grand Bend) about the iconic Broadway sensation Chicago. The opening night of Drayton Entertainment’s Chicago at the Huron Country Playhouse had the audience captured from the start. Lots of long legs, toned abs and barely-there costumes along with amazing musically talented ensemble definitely grab the attention of all in the theatre. This is not a show for young children! The darker, sultry side of life in the 1920s Chicago comes alive through edgy dancing, strong musical numbers and humour as the cast razzle dazzles its way through the story of the two divas, Velma Kelly and Roxie Hart, who vie for the spotlight in Cook County Jail after doing away with their cheating lovers. Both Jodi McFadden (Velma) and Jayme Armstrong’s (Roxie) powerful voices demand the audience’s attention from the moment they start singing. It is hard not to find a soft spot in your heart for Geoffrey Whynot’s Amos, Roxie’s hapless husband, who just wants to be seen but can never catch up to the spotlight. His rendition of Mr. Cellophane captures the sympathy of the audience, as Amos is just pathetic. Dean Hollin portrayed the sly lawyer Billy Flynn and made me hate how slimy and sleazy his character was but done in such a smooth way. Valerie Boyle gets the audience going as Mama Morton after her opening song “When You’re Good to Mama” that had us cheering for her and her powerful vocals. 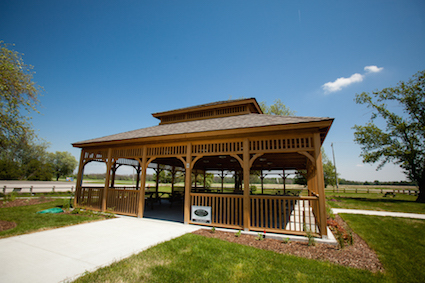 My husband and I enjoyed some salted caramel ice cream bars during the intermission under the new, large gazebo that has been recently built on the front lawn. It was great to overhear conversations from other viewers about what they thought so far. Many talked about the athletic ability of the ensemble and the vocal talents of the whole cast. Others discussed the costumes (mostly the men) who seemed to be pleased that their wives and significant others brought them to the Huron Country Playhouse. R. Markus as Mary Sunshine’s operatic voice could possibly shatter glass. I loved the shocker that comes from the character at the end! The ensemble is simply mind blowing. It demonstrates beauty and strength in its dance routines, and is definitely not hard on the eyes, thanks to Ivan Brozic edgy costume designs that leave little to the imagination. This ensemble is full of talent as its members, especially the men, take on many roles throughout the performance. The murderesses’ “Cell Block Tango” is a favourite of mine along with their performance alongside McFadden in the opening number “All that Jazz”. I loved the two-storey jailhouse set design that allowed for a very smooth transition between scenes and the orchestra being moved to the second level of the jailhouse just within view. Director and choreographer Mike Jackson has a hit with Chicago. Alex Mustakas, the artistic director of Drayton Entertainment, calls Chicago “…the hottest ticket in town this summer” and both my husband and I agree! As we walked to the car, my husband was humming “All that Jazz” and was discussing how many of his friends would enjoy seeing it. The Playhouse was packed on opening night and I am sure tickets will be limited so I would suggest clearing an afternoon or evening in your calendar to catch this show before it’s gone. Chicago runs until July 18. Tickets are $42 for adults and $25 for youth under 20 years of age. Tickets for preview performances and groups of 20 or more are $34. Tickets may be purchased online, in person at the Drayton Entertainment Box Offices, or by calling (519) 238-6000 or toll free 1-855-DRAYTON (372-9866).